person shooter genre, but it certainly shaped its future. Back in 1992, running and gunning through labyrinths with a framerate so smooth was a mind­blowing concept. 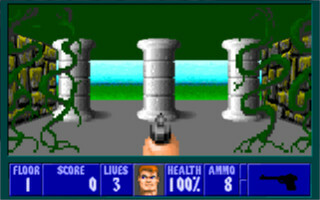 A handful of months after id Software released Wolfy, FormGen Corporation released an expansion pack entitled Spear of Destiny, which offered a brand new set of levels along with other content. For those who are hungry like the Wolf, Spear of Destiny is nothing special but will still offer a bit of amusement for anyone who likes shuffling around mazes whilst doing the chaingun cha­cha. Spear of Destiny is a prequel to the original game. Hitler’s mate known as The Death Knight managed to steal from the Allies a mystical spear that’s pierced the flesh of Christ, and so with it, the Fuhrer believes he’ll be unstoppable. Our hero, B.J. Blazcowicz, thinks it’s a load of rubbish. Not that it’ll stop him from trying to get it back, since looting the Fuhrer’s new toy might just send him over the edge. So, the super­tough commando sneaks into Castle Wolfenstein, ready to rumble with anything standing between him and the artifact. Enclosed with the expansion are nineteen new levels (alongside two secret areas), set in tunnels, dungeons, castle floors and such. There are new textures and items that decorate some of the levels, but they’re nothing to go ape over. In fact, none of the levels are particularly memorable or loveable, but they do still offer some worthy challenges in terms of nagivating and shooting. Some new songs are included as well, and even though they’re a bit samey, they still offer a bit of tenseness and ambience. The same mechanics apply from Wolf 3D – find the exit and shoot every Nazi, mutant and attack dog in sight. Bagging the super­speedy chaingun will pretty much leave our hero set for the game. For those who still care about score, there are still oodles of treasures to loot and secrets to uncover. Sure, run ‘n’ gun game­play in mazes may seem repetitive, and it can be. It’s still fun in small turns, thankfully. One particular gripe has to be the developers’ love for including very long, tight and empty corridors (often as passages to secret areas) that have many twists and turns, offering a room with a few goodies and baddies alongside. Making them so long seemed like a pointless design idea that will irritate. Some of the enemies are unfairly hidden around certain corners, ready to ambush unspecting players, so chances of getting shot by them on the first playthrough are pretty high. 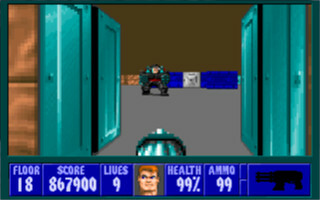 Wolfenstein 3D still has that retro charm to it, and whilst Spear of Destiny is pretty much 21 levels of the same stuff with a few different­looking tidbits here and there, it’s still fun to blast through in multiple, short turns on the game. Nothing stands out that makes it a seller, and there are a few irritating flaws that it brings to the battle, yet all in all, it’s still a good’un. http://t.co/muVCu8OpTS – Sure, the new @wolfenstein game looks awesome…but this retro review o’ mine’s about the add-on: Spear of Destiny!